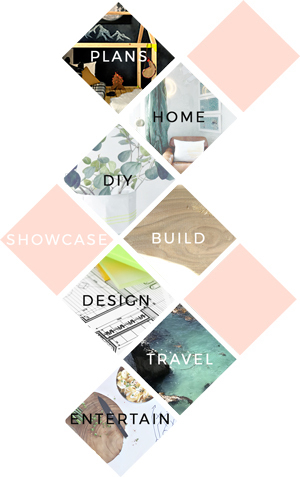 I am so excited to share my first DIY on TDC! This is a project I have been dreaming about for a while now and it turned out so amazing. I’ve been seeing this fixture pop up in some really glamorous entry ways (here and here) and I’m so happy mine is now all glammed up too! 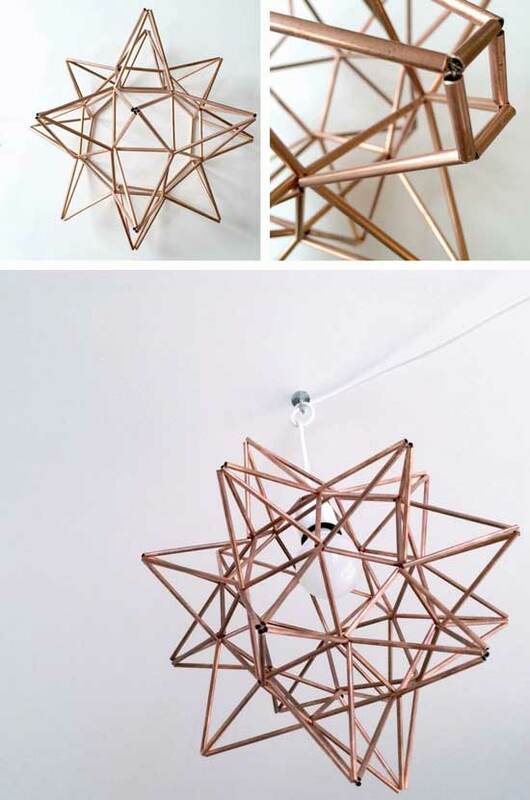 This Moravian star is a rhombicuboctahedron augmented with points. The construction is done using a similar technique to the Himmeli Orb that Rayan shared in December. 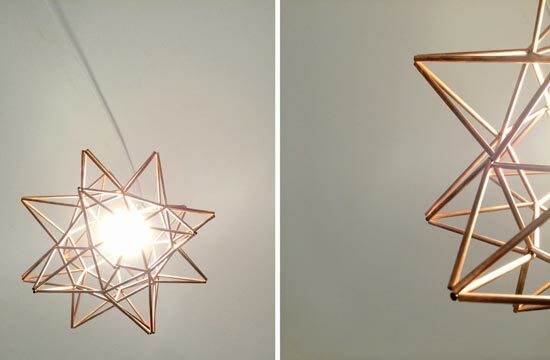 Since this will be a light fixture, I chose less flammable, heavier duty materials and my favorite: copper! The finished star is about 1 foot in diameter. 2. Cut 2 arms lengths of the wire. I found that any more of the wire gets to be too much to handle easily. 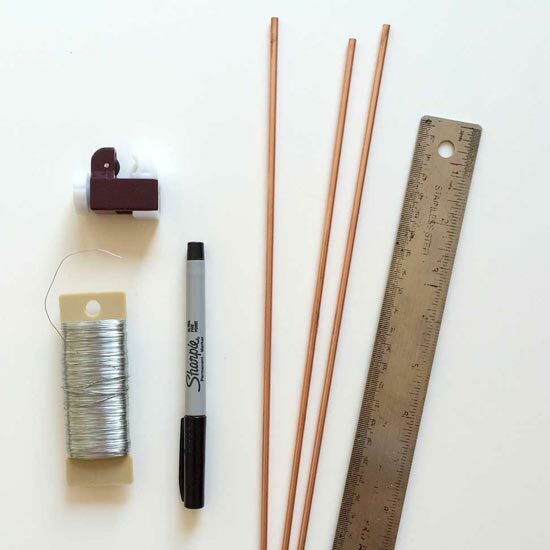 Thread on 4 short sections of the tubing onto the wire to make a square, twist the the wire ends together a couple times keeping the square tight. Thread on 2 long sections and attach kitty-corner with a twist. It is important to keep the work tight but don’t go crazy on the twists because it will add weight and a mess when you have to pull a wire back through a section. I found 1 or 2 twists was optimal. Thread the wire back through the adjacent short section. Thread 1 long section and secure with 1 twist at the top of the point. Add a second long section and secure with a twist at the final corner. Now you have your first pyramid! 3. Now make a row of 7 pyramids. Thread on 3 short sections and twist onto the opposite corner of the first pyramid making a second square. Add the 4 long sections as before threading the wire so you end with it ready to make a new square in the row. Do this 7 times. When you run out of wire just attach another 2 arms length piece by twisting the ends together. I used a twist like the end of a candy rapper, then folded the twist down to meet the wire. I found that method gave me the strongest connections. Some times a connection point will have multiple wires running into the sections. When I came to these sections with my wire end I tightened everything with a twist or two to make sure things stayed tight. 4. For the 8th pyramid thread a short section, wrap your row into a circle and thread the wire through the short section of your first pyramid. Add a second short to complete the square. Then make a pyramid as before. 5. Now complete the first side. 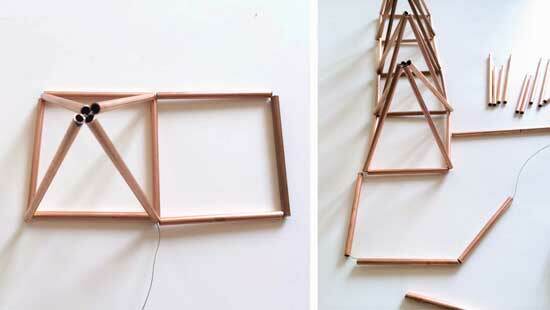 Make a square using 3 short sections and attaching to the first pyramid for the fourth side. Make a pyramid as before with the wire coming out one of the top corners. Add 1 short section and attach it to the second pyramid in the ring to form a triangle. Thread the wire through the next short section of the third pyramid on the ring, add another 2 short sections and make a square base with a twist on the top of the triangle. Make a pyramid as before. Repeat this method to make four pyramids with four triangles and a square base at the top. 6. Make the center pyramid from the formed square. Then tie off the wire, tucking the end into the adjacent section. 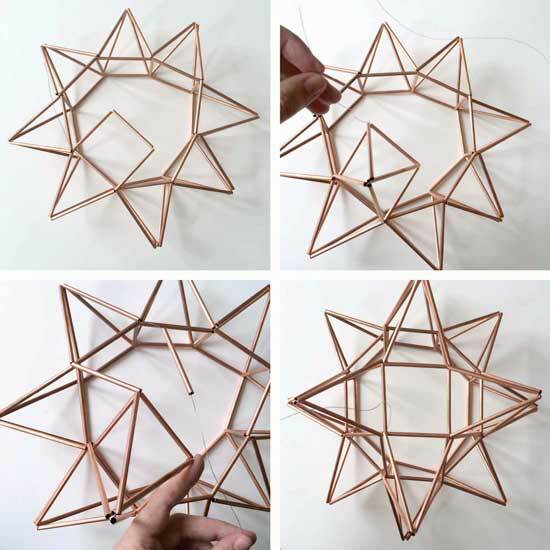 Flip over the star, twist on a new piece of wire, and repeat step 5 with the 4 small triangles and the 4 pyramids directly across from each other. The whole star will be a bit wobbly at this point but just keep going, tying everything up tightly. Things will get a whole lot more structured when the piece is finished. 7. 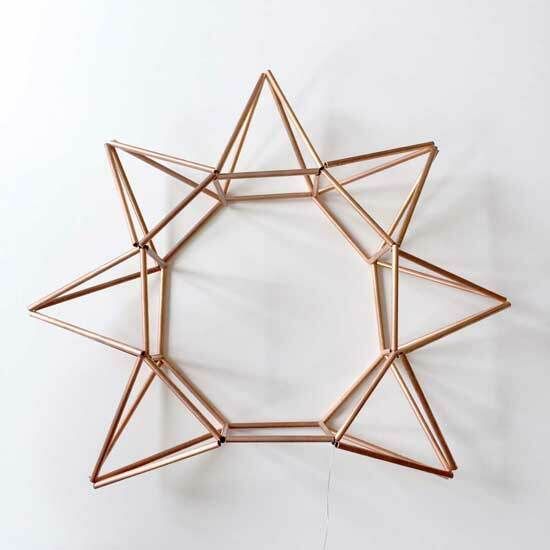 Add the last point of the star by stringing 1 short section (where you would usually put 1 long). Then string on the 4 extra small sections. Add your lighting kit at this point with the bulb (so you don’t have to cut it open when you are done like I had to!). I recommend using an LED or CFL bulb housed in a frosted dome so you don’t have to open your star to change a bulb for a while. Tie the 4 extra small sections to form a square around the lighting cord and secured to the short section. Thread the wire through an extra short section. Add a small section, run the wire through the small section of the bottom square to go up the next side of this copped pyramid. Continue adding sides till the top chopped point is complete. I re-ran my wire back through the whole top pyramid and base a second time making sure everything was tight and sturdy.